At Anderson Landscaping we believe in 100% customer satisfaction. our service or keep doing what we're doing. Anderson Landscaping have just completed our garden makeover and we could not be happier with the finished product. Colin and his team made this such an easy process from the point of first contact to job completion, these guys are highly professional and experts at what they do. 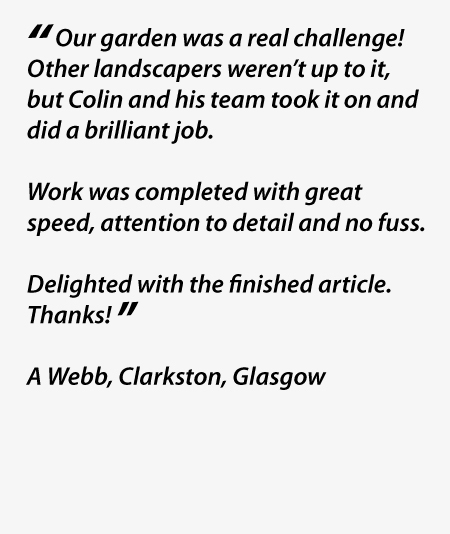 Colin was easy to contact and understood our vision for our garden and went that extra mile to ensure we were happy. I highly recommend Anderson Landscaping, outstanding job. Just recently had my driveway and front garden all renovated in East Kilbride. Colin's team did an excellent job. They worked tirelessly every day. Always turned up on time, left everything neat and tidy and always polite and approachable if there were any queries. The attention to detail and workmanship is of the highest standard. We highly recommend this company. Anderson landscaping completed a job for us about 2 weeks ago now and we are very very happy. We had our back garden and 2 car driveway ripped out and completely transformed. The guys turned up before 8 every morning and worked extremely hard every day. They were tidy and just very decent guys and hardly asked for a thing. Colin is very professional and we had no issues with The company at all. The finished article is amazing! Will definitely use them again and wouldn't hesitate to recommend them. Thanks very much guys! A massive thank you to Colin and his team, with James overseeing the guys, for a fantastic job they done on transforming the slope and garden at the side of my house. I had some ideas before Colin's 1st visit, but he gave excellent advice and other ideas on what could be done with the space which would make it even better and also save me some money! He always responded very quickly by phone or email and I decided to go with Anderson Landscaping with no hesitation. My high standards were exceeded at every turn, not only did the guys arrive early each day, they worked tirelessly whilst keeping the surrounding areas very neat and tidy. At the end of each day, the guys would clear any mess and wash down the area to the point where you wouldn't know any work was going on. The finished job is outstanding and to the very highest quality. Can't recommend highly enough, shame I can only give 5 stars. Thanks to all of the team, my daughter loves the chute, almost as much as her Dad!!! new patio and raised beds as well as replanting existing border all look fantastic. Superb work by a terrific team of guys. I would highly recommend them. and friendly service we received from the planning stage right up till the end.I was also impressed by how fast and efficient they were! We plan to use Anderson Landscaping for our front garden too and have been singing their praises to neighbours and friends. Highly delighted with our new back garden. Colin and his team are professional, efficient and tidy. We also found them to be very accommodating as we asked for a couple of changes which they were happy to comply with. We would happily recommend them. and the garden is now an easy to maintain and beautifully finished space. using Anderson Landscaping again and would happily recommend them to others. I just wanted to say how delighted I am with my garden. You have taken it from sloping mess and transformed it into a thing of beauty. Your team were very hard working, tidy and a credit to you. Will definitely recommend you to friends and family. you, we have already passed the word and will continue to sing your praises to anyone looking to have work done. thank you to all involved. My garden and patio looks perfect. I would highly recommend Colin and his team and would use them again. than happy to recommend this company yo others - in fact I already have. finances and making use of our existing patio area, everything was very professional.When the work started, guys arrived when they said they would & got finished well within the time they thought. No mess & everything tidied as they went. Would recommend. it and would recommend Anderson Landscaping to anyone. to work to clear up, all done by a pleasant and professional team. I would definitely recommend to others and will use again. "Totally professional job from start to finish, despite the horrendous weather. The decking, footpath and planting looks fantastic. I would not hesitate to recommend Anderson Landscaping. Many thanks to Colin and his team." tidied up each evening. A very big thanks to the whole team. All that's needed now is a bit of sunshine. Thanks again." his team. Best looking garden in the street." completed with great speed, attention to detail and no fuss. Delighted with the finished article. Thanks!